Disney Store UK have started this years Christmas campaign, #giftmagic. Each week they are running a different ‘Gift of the week’ promotion and are encouraging you to ‘Gift Magic’ this season. I love the campaign and all the new products they have been releasing lately. There are so many amazing pieces that would make great gifts. I decided to put together a gift guide to make it a little easier to find the perfect Disney piece for a loved one, or as a treat to yourself! The items are all in price order from lowest to the highest so it is a little bit easier to find what you are looking for depending on your budget. The Christmas Tsum Tsums only launched on the Disney Store a couple of days ago and they are so cute! I was planning on cutting down on collecting tsum tsums but I’m not sure how long I’ll be able to resist these ones for. They’d make the perfect little stocking filler. I love them all but Pluto looks particularly cute in his little snowman outfit. You can’t go wrong with a keyring as a little gift and a emoji Disney keyring sounds pretty perfect to me. There are a couple of characters to pick from including Anna, Elsa, Olaf and Mickey Mouse. I think Sven looks particularly cute with his carrot though. More Emojis! I have seen these Emoji Soft Toys a few times and they all look so cute! They are probably a little overpriced for what they are but they are adorable and are bound to get a good reaction on Christmas Day. My favourite has to be the Toy Story Alien but the Simba also deserves a special mention, he is too cute to leave out! Ufufys are still quite a new Disney collectable in the UK. They are super soft and squishy and have a gorgeous scent! The individual Small sized ones cost just £5. They are all adorable and there a few different characters to pick from. I bought myself the Piglet one when they were first released and I was so happy to receive the Eeyore one as a gift for my birthday last week. If you aren’t sure which one to get as a gift, then you could can’t go far wrong with a classic Mickey or Minnie. I don’t think you can go wrong with a good notebook for Christmas. I have a never ending collection of notebooks but you can never have enough. I love the design of this one and I personally prefer the ones with spiral binding so you can rip out any mistakes. I have already mentioned the Small sized Ufufys but they actually come in a few different sizes. You can purchase a set of two mini Ufufys for just £6. I saw these in the Disney Store the other day and they are adorable! If you aren’t sure which character set to go for then I’d stick with Mickey and Minnie. However, I loved the set of Chip and Dale as well! There are a few different sizes of soft toys from Disney Store UK but the ‘mini bean bag’ size ones only cost around £8 each and are the perfect stocking filler size. You will more than likely find your loved ones favourite character as there are so many to pick from. I’ve added a link to one of the newest additions, Thumper. I have to admit that I have put this pin on the list purely because of how much I personally love it. As the name suggests, this is a pin representing the Team Disney Dwarfs building at the Walt Disney Studios in the USA. It would be a dream come true to see this building in person and I love the look of this pin. I think it would be a great present for any pin collectors out there like me who love the behind the scenes aspects of Disney! 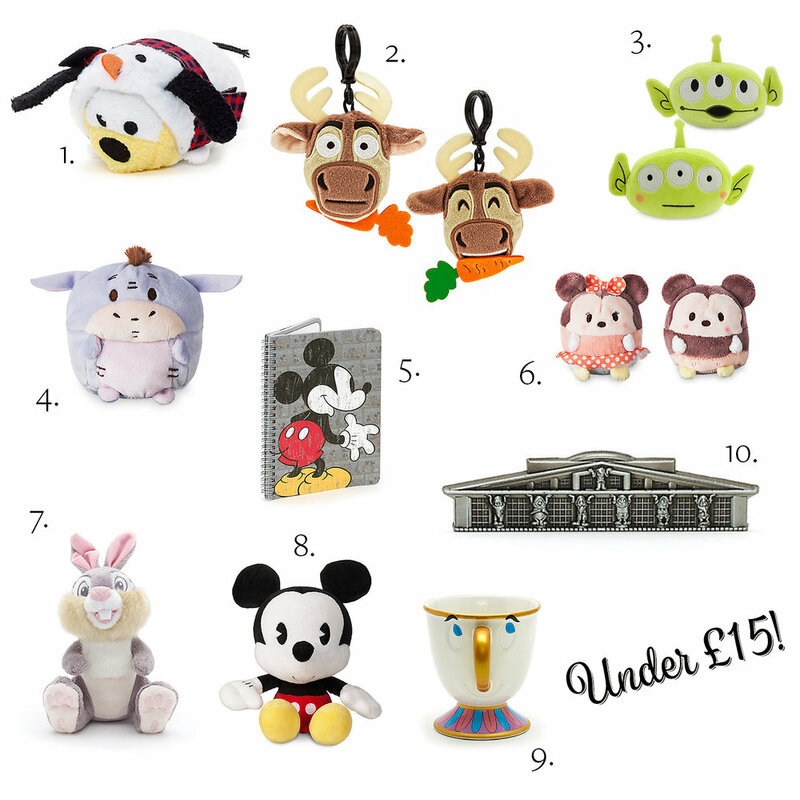 The ‘bobblehead’ soft toys are one of my favourite recent additions to the Disney Store. They are such a fun design and they just look so cute! Perfect for Disney fans of all ages this Christmas and are definitely worth the £12.99 price tag in my opinion. I’ve already bought the Mickey and the Minnie one whilst I was in Walt Disney World and I would love the others to. As well as Mickey you can buy Minnie, Stitch and Dumbo. I bought this mug from Walt Disney World a few years ago and it is still one of my favourite pieces in my collection. Chip has definitely been the most popular character for merchandise this year so I’m sure this would make a great gift! They have the most beautiful mugs in the Disney Store including these that are originally from Walt Disney World. After seeing them in person I can promise you they are as lovely as they look online. They are a bit more expensive than I would expect to pay for a mug but they are excellent quality and the design of each mug is stunning. 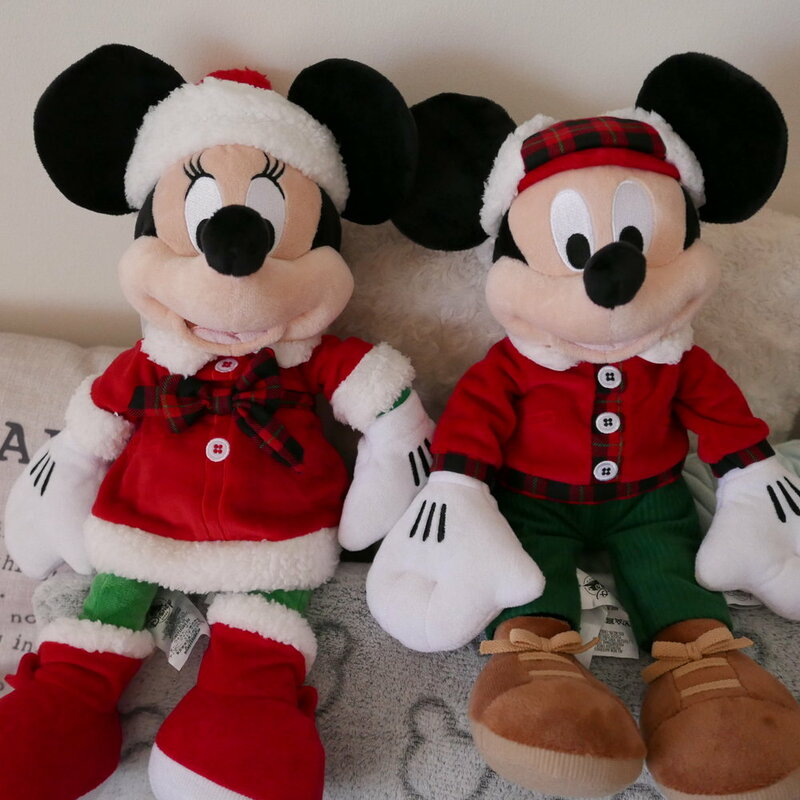 These Mickey and Minnie Soft Toys are perfect any Disney fan. They have the most adorable outfits and are the perfect huggable size. They have ‘Disney Store 2017’ on one of the feet which makes them the perfect keepsake from Christmas 2017. They are such amazing value at £9.99 each, I had to order them when I made a Disney Store order a few weeks ago. Disney Traditions are one of the most popular (and beautiful) Disney collectables. There are so many to pick from so you’ll definitely be able to find one that is in your price range. You can buy them from a variety of places and I didn’t actually realise the Disney Store was one of them until recently which is great if you have Disney Life so you can use your 10% discount. I particularly love this Eeyore one, I mean look how cute he is in his hat and scarf! Recently a few new Danielle Nicole pieces have been added to the Disney Store website including this beautiful set. The set includes three different cosmetic bags which are all stunning. If Beauty and the Beast isn’t your favourite, then there is also a Snow White set. I love the offer that comes around each year for the large soft toys. They are such amazing value at £25 and are sure to get a good reaction come Christmas. There are a wide range of characters included in the offer which you can find here. You can also personalise them for free. 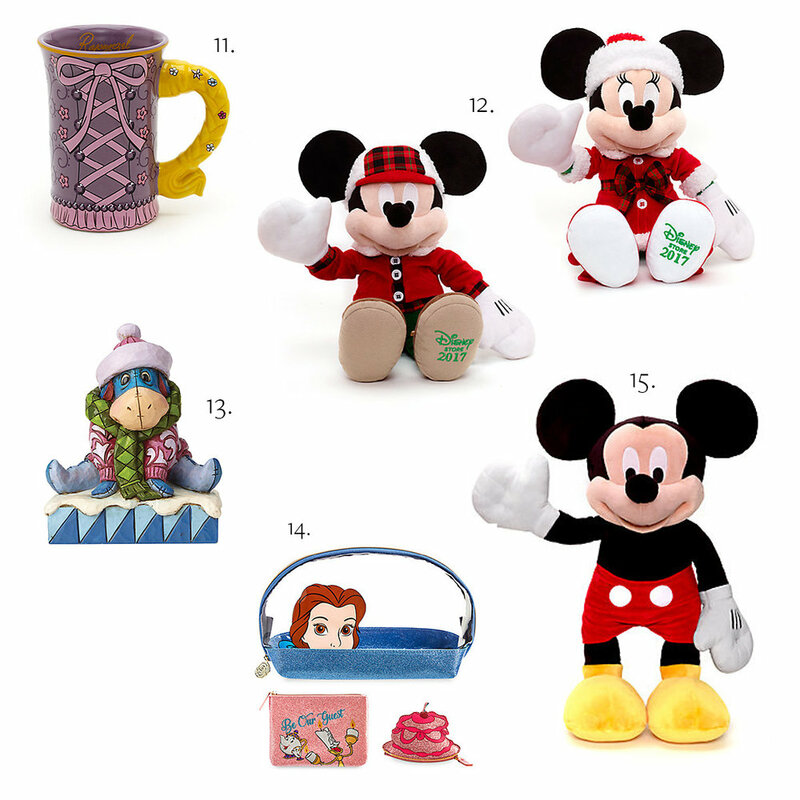 Hope you enjoyed this Disney Store UK Gift Guide and that it give you some inspiration for gifts for your loved ones!